Y'know the thrilling sensation when a shark's dorsal fin emerges from the water in a horror film, that flicker of dread knowing that they're closing in on whatever main characters are left alive? Something like that doesn't really happen in 47 Meters Down: there's a scene involving a dorsal fin coming out of the water, but the onlookers view the sight as something positive, smiling and cheering at its appearance above the water since it means their day of marine adventure will have their desired excitement. Instead, the film's title correctly describes where all the suspense takes place, concentrating entirely on how a pair of tourists handle being trapped way underwater while surrounded by those kind of massive, hostile carnivores of the sea. 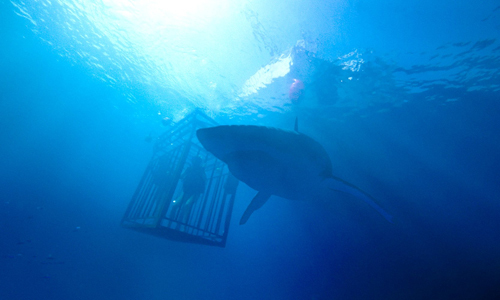 The suspense generated within the tourists' submerged cage doesn't hold many surprises, swirling together realistic concerns about the dilemma with agitated great white sharks, but the direction of Johannes Roberts sinks its teeth into enough raw tension to make the descent to the depths worth taking. That is, until the unnecessary frustrations of its ending come to the surface. Younger people on vacation make for easy shark fodder in these flicks, something that continues with sisters Lisa (Mandy Moore) and Kate (Claire Holt). They're on a trip in Mexico, soaking up the sun and drinking at the pool, which serves as a distraction from a few issues in Lisa's life that have her confronting the kind of reserved, unadventurous person she's become over the years. On a lark, and with that desire for new experiences driving Lisa forward, the sisters decide to get on a boat and descend into the depths of shark-infested waters while surrounded by a diver's cage. It's a cheap, unobserved service provided by boat owner Taylor (Matthew Modine), who also supplies the necessary diving equipment for these excursions. When the sisters go down and take their turn, however, equipment malfunctions leave them submerged deep in the water without a way back up, surrounded by bloodthirsty great whites and scrambling for a solution with the limited amount of time they have left. In order to eventually dunk these sisters underwater, 47 Meters Down goes through the motions in establishing who they are and how they'd respond to their harrowing situation, which, in theory, could breathe some life into the film's dramatic aspects. Mandy Moore's honest attempt at playing a repressed girlfriend who's enduring relationship issues gets surrounded by the tedious, seemingly obligatory build-up of the situation, unable to shore up the same kind of deeper strife of, say, Open Water's marital woes. 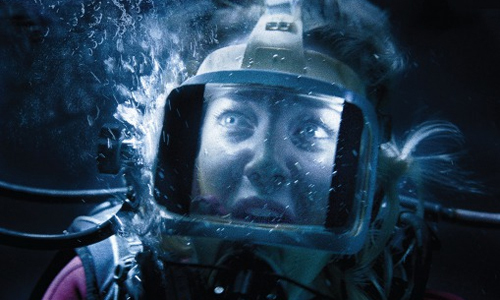 Unlike most other installments in the modern shark-horror genre, however, at least 47 Meters Down tries to support the coming events with credible dramatic cartilage, comprised of Moore's hesitations in blindly trusting locals and Claire Holt as her thrill-seeking, pressuring counterbalance. The bits-'n-pieces for a more substantial portrait of the dangers and delights of embracing life's adventures are here; they're just really drawn-out and dull, and they amount to yet another stereotypical depiction of what happens to careless tourists. Once the darkness of the oceanic depths spreads across the screen, 47 Meters Down takes a sharp turn into the waters of brisk survival suspense. The threat of massive sharks -- around twenty feet, according to Matthew Modine's salty sea captain, Taylor -- constantly swirls around the substantial cage encasing the sisters, heightened by constant radio communication between the two as they react to both the threat of an attack and their dwindling air supply. Since their faces are largely obscured by their colorful scuba masks, the tension created by their voices and their eyes becomes crucial, and the frantic vocal delivery of both Mandy Moore and Claire Holt works well with the enlivened fright in their glances around them. Between their constant monitoring of their air supply, the almost prison-like nature of their time in the shark cage, and the ever-present reminders of what could happen if they just decided to rush to the surface, director Johannes Roberts telegraphs a down-to-the-wire situation that's full of desperation ... mixed with a few harebrained choices made by the sisters that one might struggle to believe. 47 Meters Down didn't need to throw other obstacles at the sisters for the suspense to work, beyond broken communication with the surface and well-rendered, deliberately imposing sharks lurking in the distance, but that doesn't stop the writers from transforming this into a Murphy's Law kind of situation. Every thinkable problem seems to come about, foreshadowed or not, which progressively pulls down the film's credibility in a misguided effort to make the scenario as harrowing as possible, reaching a point where it seems like director Johannes Roberts and his script are jerking around those who are watching. This reaches a finer point once 47 Meters Down reaches its delirious finale, one that relies on a hinted-at yet meaningless twist to yank out the rug from under the audience for little reason at all, other than pure impact. Had the beginning been more successful at making one truly care about these sisters, it'd be the kind of tiresome and unreliable end of the line that would make one consider what the purpose was of plummeting the tourists down to the depths in the first place.